Trajan Decius, AD 249-251. 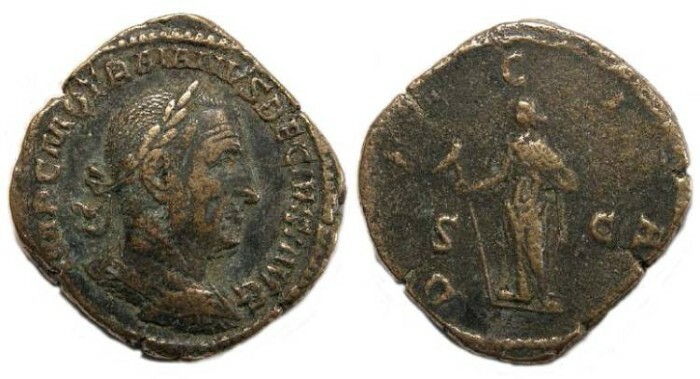 Bronze sestertius. Size : 27.2 x 31.5 mm. Weight : 18.03 grams. Grade : gVF/VF, brown patination with brassy high lights, and minor very light porosity on the reverse. Reverse : Dacia standing left holding a standard with an animal head on top, which may be a draco standard, with DACIA around. A draco standard is a standard with a wind direction indicator on top, often shaped like a dragon head or other animal head, and was used by archers to judge the wind direction and strenth to help them aim their arrows.